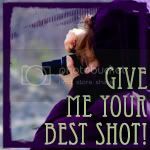 Pixel Perfect: Give me your best shot..
Give me your best shot.. This is from a recent engagement shoot I did. This picture turned out a lot better than I though it would! Oh, my goodness! I love the effect of the lights in the tree. What an intimate, lovely engagement shot! Hopping over from better in bulk. Thank you! I need to head over and look at your pictures!